With spring just around the corner, everyone and everything is just itching to get outside into the fresh air. And as the snow begins to melt we start to see all the damage the winter months did to our homestead. Our to-do lists begin to take shape and turn into something out of a horror movie. For us, cleaning out the chicken coop is usually at the top of our homesteading list. Our hens do not do well in a closed up coop so just as soon as the weather allows I like to get it completely cleaned out and washed down. A stuffy coop does not promote good egg layers so keep things clean and dust free if you want a healthy flock and a good supply of eggs. 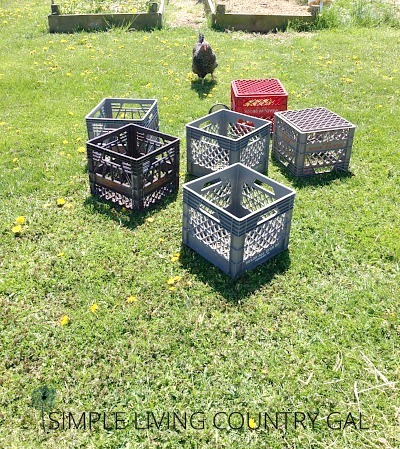 Since we live in a harsh winter state we found that the deep litter method is the perfect way to house our hens when the temps are well below zero. Unfortunately, this also gives us a pretty big clean-up chore come spring. No worries though, in spring also comes Mother’s Day and I learned a long ago that asking for hard labor as my gift is better than any bouquet of flowers. 🙂 Now, cleaning out the chicken coop is no longer a hassle but rather a cherished time with my boys. Even if it does smell awful and they would rather entertain me than do the actual work. Now, if you have read my post on the Deep Litter Method, you know that it has many advantages. By leaving all the bedding in the coop it helps to insulate and keep the hens pretty warm. It also saves me from having to haul soiled bedding in 3 feet of snow. The downfall is spring, however, when all the litter needs to come out. After our long winter, this usually means a foot or more of bedding. So, if you adopt this method, know you will have a hefty chore come spring and it is best to enlist some sort of help. Another reason why it is so important to clean your coop is to remove any pest or bugs that can cause problems for your hens. Remove the dust and debris and scrub it down naturally for a fresh start. I usually do my cleaning in the afternoon, if not I will be searching for eggs all over our farm. Waiting a bit later keeps random egg laying down to a minimum. I also will put fresh feed, water, and a snack about 10 feet from the coop. That way (hopefully) everyone will stay outside and away from shovels and rakes. I don’t want anyone getting hurt and you will be amazed at just how curious those hens will be. Hubs built these amazing nesting boxes a few years ago. They are very lightweight and easy to disassemble for cleaning. He was able to build this set up with scrap wood we had lying around our home. When cleaning out the chicken coop I simply pick the entire thing up and carry it outside. 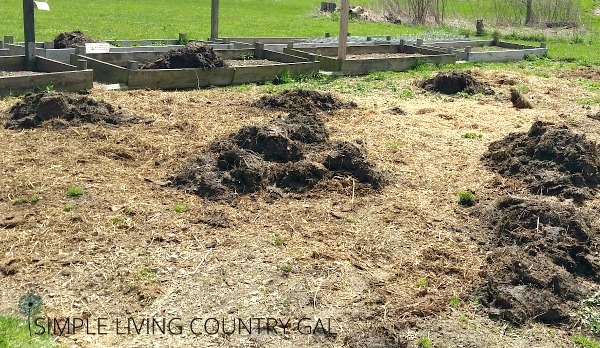 If your bedding is wet and composted it can go directly into your garden to be worked into the ground with a shovel or rototiller. Our bedding never seems to be quite ready so I put ours into our compost pile to sit a bit in the hot sun. Usually it is ready to use in a few weeks if the conditions are right. Ninja tip: Never add chicken manure directly to your plants or you will run the risk of burning your plants. You will be amazed at the amount of dust a chicken coop can hide in the corners. I find nothing works better than a good broom. Get in there and sweep it all down. The walls, the corners, the floor, even the ceiling. 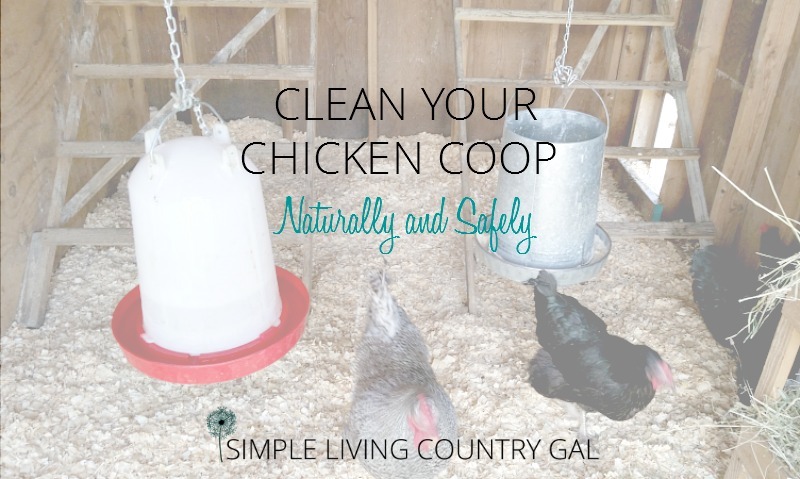 Chickens create a ton of dust so take the time to be thorough and get it all out of there. Ninja tip: Be sure to tie a bandana or other facemask over your nose and mouth while you are sweeping. Once you have all the dust and dirt out of the coop you will want to hose everything down. A broom can only get so much so by using a good hose you will make sure all the dust and dirt is truly out of your coop. Make sure to spray your ceiling, the corners, the vents, the floor, and the roost. Go one step further and use a brush and some elbow grease to make sure as much debris is gone as you can get. A scraper will come in handy as well for any petrified hen droppings that tend to turn into concrete the longer it sits. I’m sure at this point you might need a break from cleaning out the chicken coop so take some time to put your feet up and catch your breath. Since our coop is a converted shed, Hubs drilled a few drainage holes to help with the water that tends to pool up. This really speeds up the drying process. It is about this time your chickens will decide to come in and help out a bit. While things are drying on the inside you can get everything else washed. 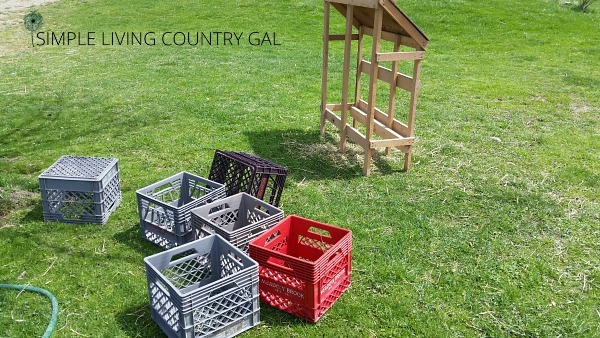 Nesting boxes, roosts, feeders, and waterers all need scrubbed and cleaned. I like to use good old soap, water, and a strong brush. Once everything is cleaned and rinsed I will spray some of this simple cleaning spray that will naturally and safely disinfect. Once everything is scrubbed, rinsed, and disinfected I like to let it all dry in the hot sun. Not only will this save you time, but the sun is a natural disinfectant. Take advantage of mother nature and plan your cleaning on a sunny day. I prefer to use pine shavings which is larger than sawdust. I have tried sawdust and even sand and I have found both to be very difficult to keep clean and harder to clean the coop out at the end of the season as well. The shavings are a bit larger so they do not make as much dust as the sawdust but still absorb the liquid waste to keep things relatively dry. We are able to purchase wood shavings from our local feed mill at $7.25 for a 3.25 cubic foot compressed bag. Yes, a little pricey but one or two bags will usually get me through the entire summer season. A small tip here, if you decide to move things around be prepared for a bit of chaos at first. Chickens are a creature of habit so when I rearranged things a bit this year, it took them a few days to figure out where to lay their eggs. 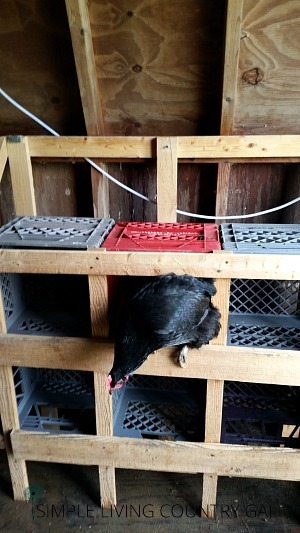 I found them scattered about the coop until a handful of days later they realized where the nesting boxes had gone to. Also, it took a little longer for them to find their water. If it is hot, you will need to watch them with this. When cleaning out the chicken coop don’t forget the outside. We have an outside run so that tends to be a large job in itself. This is where my boys come in and they do a great job and are much quicker than I ever could. First, they rake it all out getting the loose hay and debris left over from the winter. Next, they will go in with a shovel and pitchfork to get the outer compacted layer. This is important because usually things are so compacted down that drainage is nearly impossible and a good rain can cause a huge mess in minutes. By removing that top layer you are exposing the ground below and all the yummy worms and bugs the chickens love to dig for. Once that is done they will go in and use a rototiller to loosen things up a bit. This step also helps give the chickens a soft top layer to scratch on. Ninja tip: If you find that you are removing more soil than you are comfortable with you may want to add some fresh topsoil. We like to do this every third year. The fresh soil helps to keep the coop in good condition and provide a healthy environment for the chickens. The best part of cleaning the coop is all the wonderful compost that ends up in my garden. If it is still early in the season I will add the bedding to my garden in large piles and let my chickens take over from there. I cannot tell you how wonderful my harvest has been since I started adding compost to my soil. Remember to never add fresh chicken manure directly to your plants. Chickens love a good bath and yes they do it in loose dirt, sand, or simply dust. When cleaning out the chicken coop, make sure to move and replace the loose material inside with a fresh mixture. 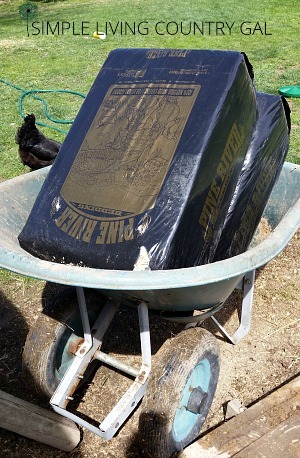 If you live in a wet area you will want covers for your dust baths so things stay clean and dry. The fun part is letting the gals all back in. They just love to explore and chatter up about how clean and tidy everything is. It is really quite comical. Nothing like a reward for all your hard work. Being proactive in your livestock’s health is so much easier than waiting for sickness to hit then treating it. Nothing promotes health more than a clean environment for living, eating, and laying. Fresh housing means healthy chickens. Healthy chickens mean large and plentiful eggs. 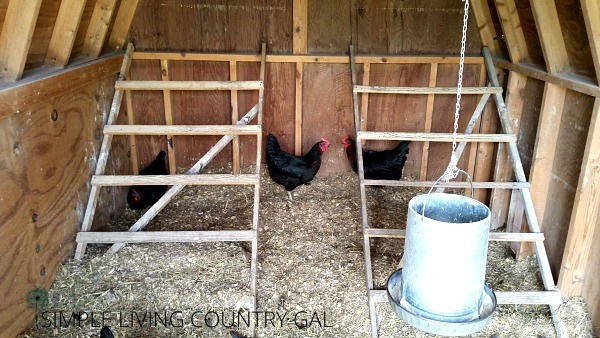 Follow these tips for cleaning out the chicken coop for a healthy and happy flock! Why do you till the run? Do you put a layer of something over the top? It was quite warm early in the year so I tossed my deep layer straw in the run. Glad I did as it’s been raining since but now it’s very smelly. Want to remove but do I replace it? They seemed to enjoy scratching thru it. Suggestions? Where I live it is very rainy in the spring. If I leave the bedding in there during the rainy season, that water gets trapped in the bedding and never really drains. The bedding then rots rather than composts and the smell is just awful. If I remove the bedding each spring this helps the draining tremendously. The reason I till up the ground after I remove the top crusty layer is the ground tends to get very compacted down over the winter. If I till it up this not only loosens the ground so it is easier to scratch through but pulls up worms and bugs that my gals love to eat. If that ground remains compacted the water just runs over it and pools up rather than drains down through. Till also helps by keeping the ground healthy for the chickens. I have tired to have chic 2 years ago but, not knowing much I ordered a coop and boy, what a mistake all that was. 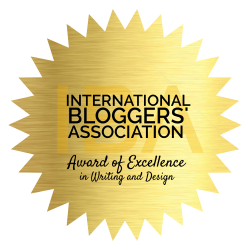 I was clueless – now, after two years I am ready to try again! I have a shed that I will make into a coop and space I cleared for a run. We have baby chics now (only 6 for now) that are currently 14 days old and getting cuter by the day My husband said I’m feeding the raccoons again. This time I will excel at this since I’m home all the time now. I am so excited you are giving chicken raising another try. If you have any questions at all just let me know. I hope you were able to read through all my posts. 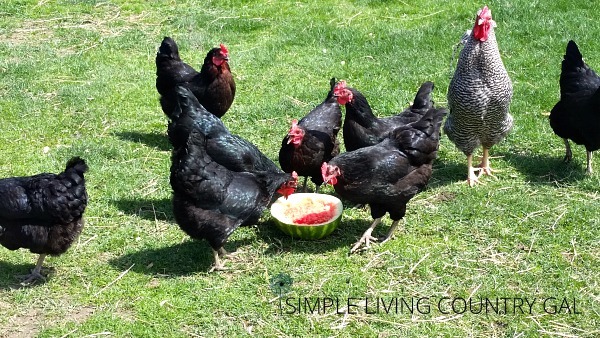 I have some great tips and tricks when it comes to raising chickens that may be helpful. We have 10 chickens for egg laying. This is our first spring with them; this time last year they were just babies! We have an indoor section with a couple boxes for eggs, their food/water and a few posts to rest on. There’s a section in the back that we can open up and I want to put their food/water in there because I think it’ll give them more room. 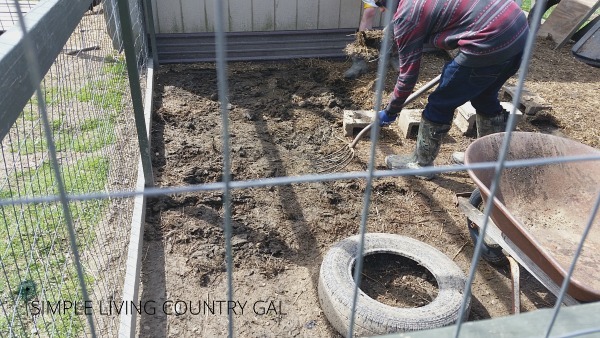 Our outside pen is also just dirt and is severely compacted right now and doesn’t dry the best so it smells. I thought about putting sod down; should we keep it dirt? The inside also has dirt and I wanna change that too. We also need to setup dust baths for them. We bought the house from my husband’s cousin so the coop is how they used it. I’m an animal lover and these girls are hilarious! I want to make sure their environment is the best it can be. Yes, it is a bit tricky when you have all dirt in your run, however, if you keep I have a spade that I take out with me for morning chores and dig up a couple sections of the pen for them to scratch in. It takes just a few minutes and the girls do enjoy digging into the fresh ground. You can put the sod in, but it will only last just a short time. Depending on how big your run is, 10 chickens can tear that sod apart in short time. So take that as just a heads up. I would definitely get the dust baths in, your gals will love it. 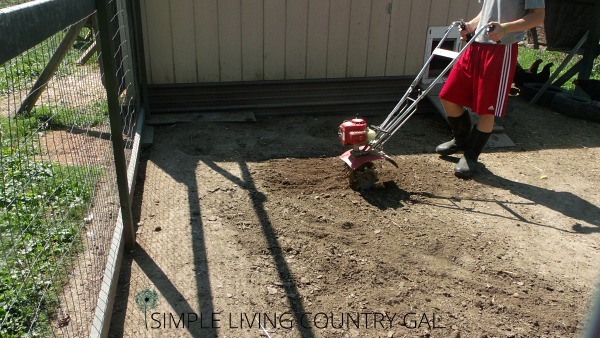 Until you get a chance breaking up your run with a rake or shovel will give them some loose ground to dust bathe in. If you have not read it yet, I have a post on how to set up dust baths that you can check out here. Newly here. I need to clean my run, is it ok to use sand for the run? I only have three top hats. I know other’s that have used sand with much success. I, however, am not a fan. I just don’t like how the sand works. It gets wet quickly, takes forever to dry out and it is heavy. Especially when cleaning it out. I would much rather use wood shavings that can be purchased at your my local feed store or even Amazon. It doesn’t take much for a small coop and it really keeps things clean. If you do decide to use sand make sure you get contractors grade. It is not nearly as fine as sand box sand and does a bit better in the coop. Thanks for your post. 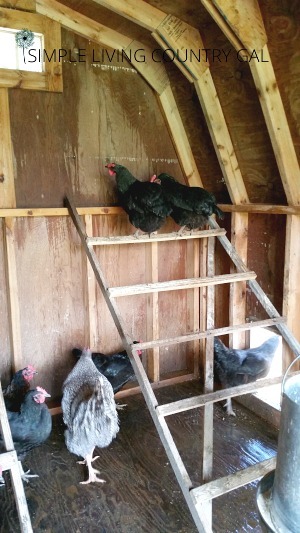 It looks as though you have a wood floor in your coop… yes? We have a raised coop and I tried deep litter two years ago. I found it was really dusty and wound up being stinky as well. I heard that if you don’t have the bacteria in the dirt helping things along, it (DL) doesn’t really work. So last year I started just removing the poop in the morning and throwing on the compost pile. We only had 4 hens at that point, so it really wasn’t much work. Now we have 5 chicks so we made a much bigger (still raised) coop and I am wondering if I should rethink the deep litter method. Thoughts? Are you using saw dust or wood chips? I have found that the wood chips really cuts down on the dust. Yes I do have a wood floor which does help quite a bit. Whenever things got too stinky that is when I would toss another layer of wood chips down. It is really amazing how that one step removed most of the odor. I have over 2 dozen hens so cleaning our coop out daily is just not an option. I usually clean it out in April, July, September each year and I have not ever had a problem with worms or other ailments. With all our animals I have a rather large compost pile. 🙂 I keep things sorted by year. So I know when it’s time to get the garden set up to use the oldest pile first. That ground is simply amazing! When it has had time to sit it really turns into the perfect compost that is a wonderful addition to my garden. Thanks for the post! I have a dirt run, too, but the trouble I’m having is keeping the dust down when it is dry out. It blows from the run onto m6 porch and covers everything in black dirt (probably with a healthy dose of dried poo!). Do you have any advice or ideas? So far all I can think of is planting some sort of living screen, but if I plant anything thick enough to block the dust, I can’t see my girls and am probably creating a hiding spot for predators. Thank you! If you are having a problem with dust in your run you can add something to it to help. Contractor’s sand (do not use sandbox sand it is too fine), mulch, old leaves, or even grass clippings. You can just toss it in the run in small piles and let the chickens scratch it around to spread it. That should help with the dust and keep things a bit cleaner for you. I love the idea of the living screen, but I do think it is more important to keep a clear line of site to your gals so you do not have to go out and check them as often. I am doing a living trellace and will be writing a post on it very soon. That may be another option for you as well. Hope this helps! The tires are for dust baths for the chickens. I have tried different setups and this by far works the best. 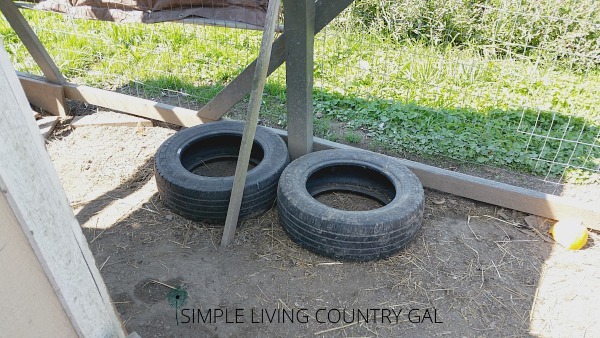 They still take a dust bath in the loose dirt of coop, but the tires just provide a more contained space where I am able to add things like wood ash, DE, and sand to make it more beneficial. You can see how I do it in my post, How to build a dust bath for your chicken. I used to have a turtle sandbox w/lid that I would cover up when it rained. Now…new home, new husband, new coop (in process) & new birds. Just might find another Turtle sandbox. I’ll drill holes in it this time! I have never owned chickens and would love know how often do you do this? I clean my coop every spring and fall this way. I may have to do another clean out if something comes up, but more often than not where we live twice a year is good. Now, this will depend on a few things for you. 1. Where you live. If you live in a wet area, then your hens will track in “wet” more often. 2. If you have more hens than room, they will mess things up inside much quicker. So, I use this rule of thumb. If it smells I either add more bedding or clean it out completely if too much bedding has already piled up. We have has chickens for about 7 years and the ground in the run was always fine. This year we have had so much rain and it is so boggy and squishy and smelly I do t know what to do! We put some wood chips down but it it didn’t help. The mushy stinky area is mainly in the center. HELP!! We ran into this same exact problem a few years ago and yes our run was a complete mess. Nothing was going to remedy the problem other than a week of sunshine. To get us through I put in a path of cinderblocks. This way the chickens could still get out in the fresh air, yet say out of the mucky mud if they wished too. This worked so well that the eggs and coop stayed much cleaner once I put the cinderblock path in. Sorry, you have such a mess on your hands, one of the joys of homesteading is being at the will of Mother Nature…grrrr. I’ve just discovered you … And happy that I have. I am a new homesteader, my husband and I moved on to 5 acres in Central Oregon 3 years ago… Last summer I got my 4 ducks and my 3 chickens… And this Fall I purchased two 4 month old dwarf Nigerian goats! I am brand spanking new to all of this!! Welcome, I am so excited you have started your homesteading journey. I have a video tour I did a few weeks ago of our coop, you see it in this post here. How to keep Chickens Warm in the Winter.